Only customers who still have their GROHE Blue system equipped with the old filters must update their water system with a new filter head in order to use the new BWT filters. To make this ONE TIME switch, GROHE offers filter refitting sets. These filter replacement sets include a BWT filter + a new filter head. The filter head is offered free of charge. To order the filter replacement sets, please contact your local GROHE distributor or visit www.blueshop.grohe.us. For your convenience, we will automatically send a replacement set upon purchase of an old GROHE Blue filter when you order your filter online. The installation of the new filter head is easy and only takes a few minutes. 2. Close the shut-off valve and depressurize old filter via flush button on the filter. Use a container to catch access water from gray hose next to the filter. 3. Remove the old filter from the water system. Then detach old filter head from the supply lines. You might need an adjustable crescent wrench to loosen the nut. indicated on the side of the filter head. Connect the blue PEX hose which is attached to the back of the chiller. Re-use the john-guest push fitting from your old filter head (white plastic attachment previously attached to the blue PEX hose). 5. Then gently screw the filter head onto the filter. Make sure you don't damage the 0-ring when screwing on the filter. 6. Turn the water supply back on and check for leaks. 7. Perform a mandatory filter reset by holding down the left button on the chiller for three seconds. Release then press again to where the display reads 99. Next, press the middle button to match your filter size with the water system. 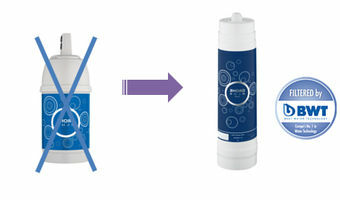 See filter reset instructions provided with your GROHE Blue® water system for filter codes. 1. Do I have to exchange the filter head every time now when I exchange my filter? Answer: No, you don’t. The filter head only needs to be exchanged once. After that, the Blue water system can be normally operated with individual BWT filters. 2. Will end customers receive the replacement set for free? Answer: No, they will not. They will have to pay for the filter. The filter head is included for free. 3. Will it be possible to order the filter head by itself? Answer: No, the filter head is only offered in combination with the new filter. 4. Is the replacement of the filter head difficult? 5. Do I have to update my Blue water system right away, even if my current filter is still good? Answer: No, you don’t have to update right now. The filter switch can be performed when your current filter needs to be exchanged anyway. 6. Does everybody have to exchange the filter head? Answer: No, not everybody has to perform the filter switch. 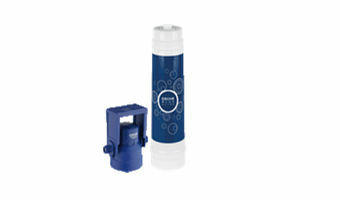 Only customers who have a GROHE Blue water system that is still equipped with the old filters must perform the update. If your are already using the new BWT filters, there is no action required.